Christ Church University Canterbury are proceeding with the construction of a new £47m landmark four-storey campus with Michael Nugent Ltd chosen to provide the M&E. The new 18,000 sqm building, set to open in 2020, is being built on the back lands of the former Canterbury Prison site, providing new teaching facilities for science, engineering, technology and health. It will also house the Kent & Medway Medical School, a shared initiative with the University of Kent. 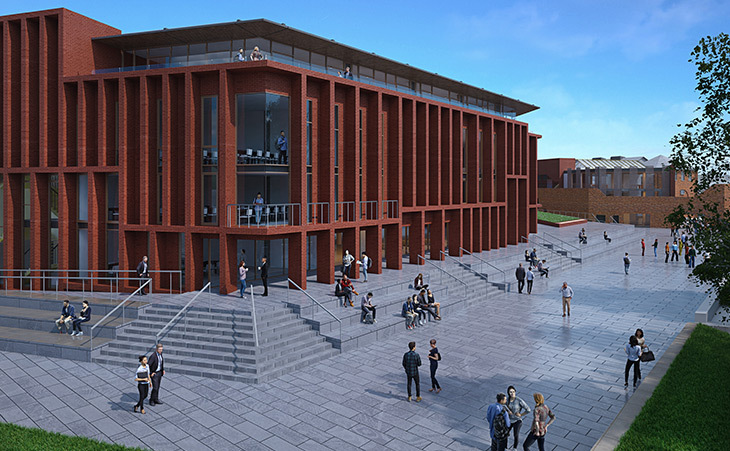 Canterbury Christ Church University is investing £150m for overall redevelopment of the university estate with the Creative Arts Building the first development to open as part of the 15-year plan. The new facility  represents phase two with the conversion of Canterbury’s 19th century prison planned as the final development. Working on behalf of main contractor Gilbert Ash, Michael Nugent Ltd will provide full Mechanical and Electrical services installation, including heating, cooling, supply and & extract ventilation, chilled water services, laboratory gas systems, structural cabling and security systems. MNL are proud to be part of such a high profile educational project, having a wealth of experience providing M&E services for various schools and universities throughout Ireland & the UK.